If a Pope didn't believe the doctrine of the Real Presence, would he lose the authority to teach? Many disciples left Jesus after that and it was left to St Peter (first 'Il Papa') to speak up on the Apostles behalf, saying, 'Lord, to whom shall we go? You have the message of eternal life.' That's kind of like what giving religious assent to the incredible is and it is noteworthy that St Peter spoke for the Apostles in giving it. "This is incomprehensible, but I believe You." 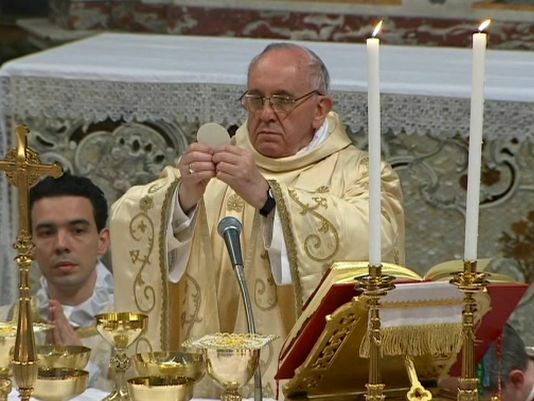 If this Pope doesn't believe that the Eucharist is the Body, Blood, Soul, Humanity and Divinity of Our Lord, then that wouldn't just explain things a little. That would explain everything. One does not need to go over a year of confusing statements and actions again. If he didn't believe that doctrine, which all Catholics must uphold, or if he openly opposed it, that would pose serious problems for Catholics across the World, because that would make the Pope outside of Communion with the Divine Head of the Church, Jesus Christ and, of course, St Peter. The implications are terrifying. Absolutely nothing - including the Eucharistic Lord Himself - would be safe in such hands. The Vatican must, at the very least, confirm that the Pope did not say that because if Pope Francis did say that, Catholics have not just a right but a duty to resist his teaching. Not only that, but His Holiness, shouldn't be receiving Holy Communion. As well as little teaching on the family, and barely any concrete teaching on doctrine, other than platitudes on the poor, Confession and 'mercy' we have received as yet very little teaching on the Holy Eucharist from His Holiness. With 75% of Catholics completely unbelieving of the Real Presence, now would be a good time. It is well within the Pope's power to put this lady - currently discussing Pope Francis's reported words on divorce, remarriage and 'bread and wine' in various media outlets - right. In so doing, it would confirm that His Holiness does indeed believe that which the Church has believed and taught 'always and everywhere'. This is a perfect opportunity for His Holiness to give us some clear, concise and much needed teaching on the Most Holy Sacrament of the Altar, because 'bread and wine' it no longer is, once consecrated, even if the Holy Eucharist appears to the senses to be just that. There is no point in fasting even an hour before Communion if it is 'just bread and wine'. The Lord did not die on the Cross in order to give us bread and wine. We had that already. He died upon the Cross - and was raised again on the third day - and left us Himself, His Body and Blood, under the guise of bread and wine as a remedy for our souls and the pledge of immortality for those who persevere to the end in the One True Faith. The Eucharist is God Himself. It is Jesus! If a Pope did not believe that, not only would faithful priests refusing Communion to those in a state of mortal sin be 100% correct, but every Catholic who held onto that teaching would, yes, be more Catholic than the Pope, because that Pope would have ceased to be a Catholic. When I first read this sentence in the Daily Mail I thought that it is indeed possible that he really said it. In my opinion every priest who believes in the Real Presence could never ever celebrate the Holy Mass in such an ugly environment as St. Martha´s Chapel if he could go to St. Peter´s Basilica round the corner. The reports that he never genuflects at Mass before the Eucharist also fits into the picture. Doctor of the Church St. Alphonusus de Liguori found very harsh words for priests who weaken or destroy the faith of the laity through their irreverend behaviour at Holy Mass. "A little bread and wine 'does no harm,' Pope Francis said to a divorced woman as he flew in the face of Catholic convention by telling her it's okay to take communion." Completely off-topic but this has just come up on the Tablet website about Bobbie. The serpent said to the woman, "You surely will not die." I am glad you have brought this up. I was so shocked when I read this but keep telling myself that it must be a mistranslation. it's numbing realizing how far things have gone. That we should even think it possible that he should say this, but, given the passed 12 months, i'd say 50/50. not much help. but then if you've ever seen some of the videos of how he shells out the precious body of Our Lord, maybe he really doesn't believe. I have to ask why, in the 'age' of instant communication, the vatican sits on this and won't confirm or deny. To say this is a private matter between pastor and parishioner in no way excludes them saying, 'no, he never said THAT'. Plus, does this mean we can have over the phone confession now? I fear you are right, but hope and pray that he did not say this. That cannot be true, otherwise what would he think he was genuflecting before at the consecration? Tell me when the Pope says something Ex Cathedra and then hopefully ill listen. Until then I need to focus on following Magisterial teaching. I thought my other half was quoting a Daily Mail Headline yesterday - not what His Holiness is reported to have said!!! That's the alleged quote that worried me most when I first read it in the Torygraph. Because if we are apparently only receiving bread and wine then everything is up for grabs and what was then allegedly said by Francis follows the same screwball logic. When I went looking for the quote again, I couldn't find it. The fact that many faithful Catholics are unsure of what Bishop of Rome Francis actually believes is alarming to say the least. His constantly contradicting himself might have something to do with that, right enough. If Francis can find the time to personally ring a stranger in S. America, surely he can find the time to personally clarify remarks attributed to him which have troubled and confused so many. But I won't hold my breath. Please forgive my comment if it hurts anyone's faith "in their Faith", but I have just came to the realization one-day that perhaps this Pope, Pope Frances in NOT the true Pope, but rather, Pope Emeritus Benedict XVI IS still the true Pope, "lurking there in the background", suffering and praying for everyone of us. As I've read, if in-fact Pope Emeritus Benedict XVI was coerced or "forced" to resign for any reason (such as bodily-harm, assassination threats), then his resignation is most definitely NOT VALID and he's the true, reigning Pope. I'm NOT a "sedevacantist",(the true Pope is still there, as I tend to believe); it reminds me of that expression, "cannot see the forest because of the trees", can't see the real issue at hand because of all the contradicting details, and also perhaps we cannot see the "wood of the true-Christ (true Pope) because of all the contradictions and "details" this Pope is causing. In any case, there have been truly rotten and heretical Popes in the past, so perhaps our focus should be in praying and praying "hard", especially the Rosary that's so powerful and receiving the Sacraments. As Our Lord JesusChrist want no man to be lost, but saved. This is all very disconcerting to me, but I believe God is still in control and we are always able to do our part and pray, etc. God bless you Laurence and ALL your readers and loved-ones. And also something that St. Maximilian Maria Kolbe said comes to mind, which is: "No one in the world can change Truth. What we can do and should do is to seek truth and to serve it when we have found it". There are so many 'say it's not so' aspects to this story (which initially in a fit of Paschal joy and charity I was inclined to disbelieve)that my mind is terminally boggled. But one question did occur to me. This is the humble man who prefers not to be known as the Supreme Pontiff, prefers to just be the bishop of Rome and wants to decentralize the Church. So why is he interfering in a matter which should be in the jurisdiction of a fellow bishop? How would he like it if, say, Cardinal Nicholls started ringing up people in Rome and telling them to ignore what a priest of the diocese of Rome(or its bishop)said? Silly of me to expect consistent behaviour I suppose. Still, maybe it'll turn into the latest of those he's been mistranslated/doesn't speak very good Spanish/the person he was speaking to dozed off and made it all up later stories. It wouldn't be beneath Pope Francis to say something like this, he does not think before he speaks. As Auxiliary Bishop in Buenos Aires in 1996, the Pope was involved in the investigation of a Eucharistic Miracle in the city. Apparently he instructed that professional photo's be taken and they are very impressive. I wonder if this occurred in that place and time to remind the future Pope especially of the truth of the Real Presence. The point is, the Holy See has once again refused to mitigate a foreseeable egregious worldwide scandal - by simply and clearly stating the relevant simple eternal truths of Christ's teaching, Church dogma and the natural moral law. The tortuous irrational excuses are painful and add to the diabolical disorientation. Didn't you know that it was just "Father Bergoglio" that called the woman?? By the way, have you added "bat-like Christians" to the papal canon of deprecation?? I agree, but what does 'credibility as pope' really mean? That, as rosaMaria points out (and she's in good company with some well respected Italians here) that Benedict is still the 'real' pope? So if the world press are now saying the Pope called Holy Communion a little 'harmless' bread and wine, all the Vatican has to do is say, 'he never said THAT!' it's not hard. also longnecker said: 'Through ignorance and malevolence the members of the secular press will distort the church’s teaching any way they can.' Now replace 'members of the secular press' with Frankie and his cohorts. Still holds true. My problem is _ I think he is quite aware of this...so? The fall-out of that phone-call is that horrible headline - and Mr. B. is correct in challenging these pastoral phone-calls...but then Pope Francis has made it quite clear - he doesn't really care a whit about what traditional Catholics say - but at least we can strenghten each other meeting here on good Catholic blogs like this one...in order to resist the sloppiness of such a papacy! I repeat _SLOPPINESS - is this worthy of Our Lord? p.s. very apt quote, kim seattle. It was me (or should that be I) who said it couldn't be true. I think it was so shocking I couldn't, wouldn't believe it. I'm sorry. If its not true it's easy enough to publish a denial. That denial has not been forthcoming. As rosemaria says pray. Pray the rosary especially. If we're saying it now, let's say it twice as much. Let's spend more time in front of the Blessed Sacrament. Those of us who don't work, pray like there's no tomorrow. We are in deep ^*%%. Only God can help us now. Hilary White has some good advice over at Orwell's picnic. Go to Mass, go say the rosary. God send us we have a holy, orthodox Pope. Lepanto, thank you for mentioning the miracle in Buenos Aires. I just watched a youtube video about it and it's quite fascinating! I had no idea about this incident! Oh dear. But at his retreat on a UTube, the Pope didn't genuflect in front of the tabernacle either, so he may not believe in Transubtantiation. What with the episode of the lady in Argentina. The Pope has arthritis and can't genuflect, this is common knowledge. I'm rather concerned that that such a ridiculous claim to undermine his orthodoxy is allowed to go unquestioned on this blog. The Pope can ably wash the feet of women and muslims with no problems whatsoever, or kneel at a peace prayer vigil in Rome. Pope Francis can kneel with great difficulty but not genuflect. Yes, he knelt to wash feet on Maundy Thursday but you will have seen that he had to be very physically lifted up by an MC at each side. The same with the kneeling for the peace rally - he has less difficulty going down but needs significant support getting up. You will also see that he has a padded cushion available when he kneels which wouldn't be possible when genuflecting. Perhaps when God inflicts you with severe disabling agonising arthritis, you will be in a position to judge?! Until then I suggest it would be more Christian and charitable of you to shut up. I imagine Francis considers the sight of himself having to be physically lifted up by 2 x MC's after genuflecting would be rather unsightly and distracting during the Eucharistic prayer. Lastly I don't see how whose feet he was washing is relevant to the topic at all - in fact just more evidence of your snarky disrespect. I am constantly amazed at your total lack of self-reflective abilities. Perhaps you should go on a Jesuit retreat and learn the Ignatian exercises?